Baby Grouch woke me this morning with her chatter and her happy squeals and periodic shouts of “Mama!” coming from her crib. I padded to her room, in my pajamas, and smiled at her when she exclaimed, “Morning!” as I walked in. “Book. Book. Cookie”. We had the time, so I acquiesced to her demand that I read her “The Best Mouse Cookie” before bringing her downstairs for breakfast. She ate some steamed broccoli (might as well squeeze in a vegetable wherever you can, right?) and a few bites of peach yogurt before asking me to make her a waffle. “Bite. Faffle!” Again, I complied with her request, because today was technically a holiday (President’s Day, but whatever, I had the day off) and most days I’m the one calling the shots. Before walking to the toaster, I turned on Pandora’s Nursery Rhyme Radio, one of her favorite stations. I came back with the waffle for her and sweetened black tea for me, and before I could set down her food, she held out her arms, saying, “uppie”. Instead of telling her to finish eating at her seat, I unbuckled her from the booster and swooped her onto my lap, placing the waffle in front of both of us. And there she stayed for the next hour and fifteen minutes. Compared to our normal rushy-rush attitude, we lingered. She tickled my knees and I gave her some laughs and tickled her back. 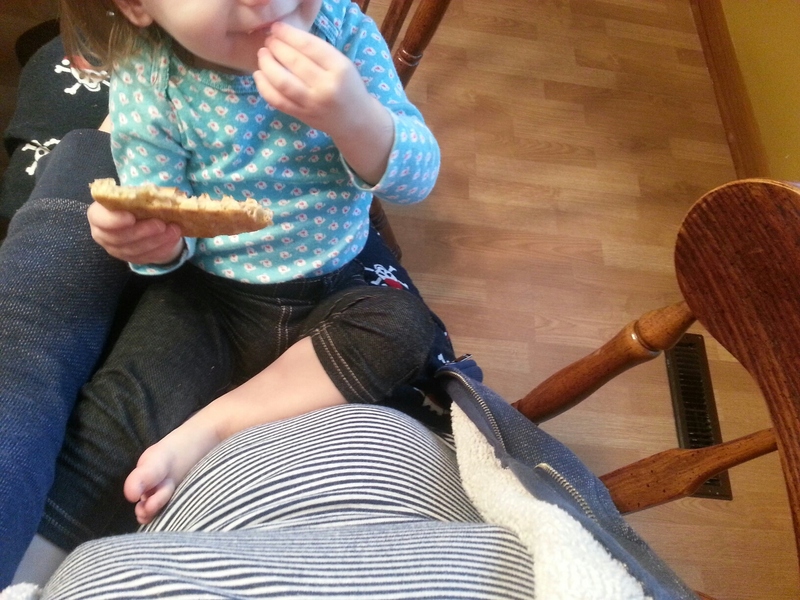 She sat on my lap, turning to face me, placing her feet on my pregnant belly, my arms supporting her back. Every so often I’d get a hug, or a pat, or a stare up at my face and a “Mama!” coming out of her mouth. We sang and we sang and we sang, me, completely off-key, she, with an impressive number of correct words or close-to-it sounds, to the nursery rhymes she loved – her favorites (I could tell they were her top choices because of how much she sang along and the “yay!” she shouted after they were done) included, Wheels on the Bus, Somewhere Over The Rainbow (the Israel “IZ” Kamakawiwo’ole version), Skidamarink, The ABC’s and Apples and Bananas. She does not like Hakuna Matata, “don’t like it. Uh uh”. Between songs we tickle-tickled and peekabooed and then went back to singing, as she slowly continued to munch on her waffle. Midway through our special time at the kitchen table, I thought I could capture our moment, as beautiful as it was, and snapped a couple mother-daughter selfies. And EW. They were not pretty. They showed me in my black skull pajama pants and clashing blue and white striped tank top, with my splotchy skin and puffy eyes and protruding stomach. She’s pretty darn cute, but in these pictures, her hair was all over the place, her eyes half-shut in the photos. The angles were awkward and, well, we just weren’t so photogenic this morning. After a few attempts I realized there was no way to capture the moment, and that was okay. I put away the phone, and we went back to focusing on each other and I thought to myself, what a good lesson this was for both of us. Sometimes the most remarkable moments are the ones that look unremarkable. The ones with so much beauty coming from the inside, there isn’t any left for the outside. Physical beauty is overrated. We sat, for what simultaneously seemed like an eternity, and also just an instant, soaking up the relaxation and comfort of each other’s company. When she finished eating, we got up and danced the Hokey Pokey before it was back to reality, and I started cleaning up the waffle crumbs that had fallen to the floor and started putting on her coat and shoes so we could head to the grocery store, resuming the typical busy-day-schedule we are so accustomed to. So much beauty in the message. In my mind’s eye, I could see you two enjoying the time together and it warmed my heart and made me smile. Beauty isn’t just a visual thing, it’s heartfelt and precious. I hope when you look back on the photos you’ll remember the wonder of the moment and smile at the beauty of it. Beauty most certainly isn’t only visual. This was a good reminder of that for me. You’ve captured (and shared) the beauty by writing it down, thank you. Is this Zen? I think this might be Zen. No pics needed here. Ah, but you did capture the moment – you got a truthful photo of a mom and her child. If you still have it, keep it – you’ll laugh at it about 20 years from now. Oh, no. I didn’t keep it! hah. Gorgeous. Simply gorgeous. Thank you. Innerconnectedness. It’s what we crave. Being in the moment. It’s what modern life lacks. I hope you have many more morning with P when you listen to her needs and discover that they’re the same as yours. You did a great job capturing the “full feeling” of being with a loved one. Nicely done. Thanks. Yes, interconnectedness is really a beautiful thing, isn’t it? For sure. This was definitely one of those times I wanted to be sure to remember, camera wasn’t doing it justice – and I was NOT about to sacrifice the experience for the exposure. I was just checking in here to see if there was something new from you, and I don’t know why THIS gem did not show up on my Reader. Angry now! But I just adore this. The attention to detail to this slice of life piece is like a tapestry! I love a writer (like you!) who can elevate a quiet few moments by infusing it with meaning and significance (in a very sleight of hand way!) Thank you, magician/masterpiece writer! Holy moly, well thank you, ,my dear, I”m honored. I’m such a bloggy slacker these days – I am honored you took the time to think of me. And not only are your posts eloquent, but your comments as well! This post pierced my heart. That is all. Thank you and thanks again for sharing it. Reblogged this on saeedelawa's Blog.